Create a beautiful vista with our Tulip Mixes. Triumph Tulips are hardy and very reliable, ideal for garden beds and pots. Long lasting flowers in the widest of colour range, the Triumphs are every gardeners favourite. 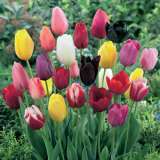 Single Late Tulips have tall strong stems with well shaped blooms that retain their shape and colour to the end. They are the best variety for naturalising and are perfect for warmer regions, but will also work well in a cooler area and extend the display well through the Spring Months. Ideal for pots, containers and garden beds, they also make excellent cut flowers. Single Late Tulips are the best choice for warmer climates, cool them in your fridge for 6 weeks then plant them deeper than recommended, and lift them once they die off.